Photo: Wheaton students and graduates at Jubilee Centre resource centre indexing library books that were donated by Crossway publishing. 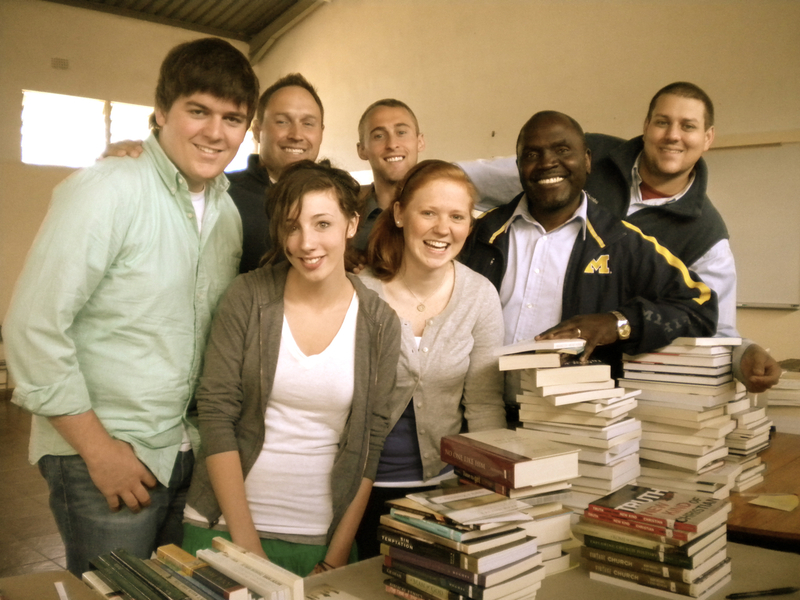 Four students from Wheaton are in Zambia with Student Ministry Partners (SMP). Hannah Schwabe (’13), Samantha McKean (’13), Alex Jones (’13) and David Lee (’12) are serving at Jubilee Centre, a ministry run by Pastor Lawrence Temfwe (MA ’99). David Bramlett (‘07), Dan Weber (‘01), and Amanda Weber (‘02) welcomed the SMP students. The Weber’s are serving with Jubilee Centre for the next three years, and David Bramlett is completing a one-year stint that saw him train teachers from community schools who despite limited resources have the responsibility of teaching thousands of underprivileged children each day. Since 2004 Jubilee Centre has been receiving students from Wheaton College to serve in the various initiatives that seek to empower and mobilize churches to be agents of change, bringing Christian hope, justice and wellbeing within their communities. During there stay, the SMP students will teach English to students who attend Community Schools connected to churches in the Jubilee Centre Network as well as participate in HIV/AIDS Abstinence Programs. Additionally, they will begin the daunting task of profiling the 6000 orphans and vulnerable children who are supported through JC Network churches.